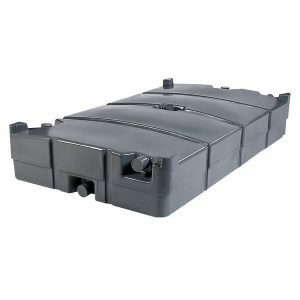 Capactity: 250 gallons capacity allows for maximum waste storage. SKU: HT01-0250 Category: Portable Toilets Tags: portable toilets, waste containers Brands: PolyJohn. The 250 Gallon Waste Holding Tank feature heavy-duty thick wall construction is an sanitary receptacle for waste safely contained without the threat of cracks, leaks, or spills, making it perfect for construction office trailers, businesses or events producing food grease and use in conjunction with a freshwater delivery system where indoor plumbing is not an option. 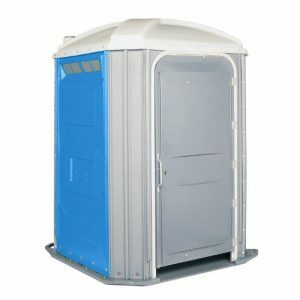 Both functional and discrete way to store waste underneath a trailer, beside portable wash station, or outside of a portable restroom, Our Waste Holding Tank is a necessity for any long-term portable restroom rental. Whether your customers are creating an outdoor rest area for a work site or for a special event, our tanks reassure their workers or guests that waste is being stored safely.